It becomes even more complex with water, with oranges and salty caramel. Great barrel that does not completely cover the maritime distillery character. 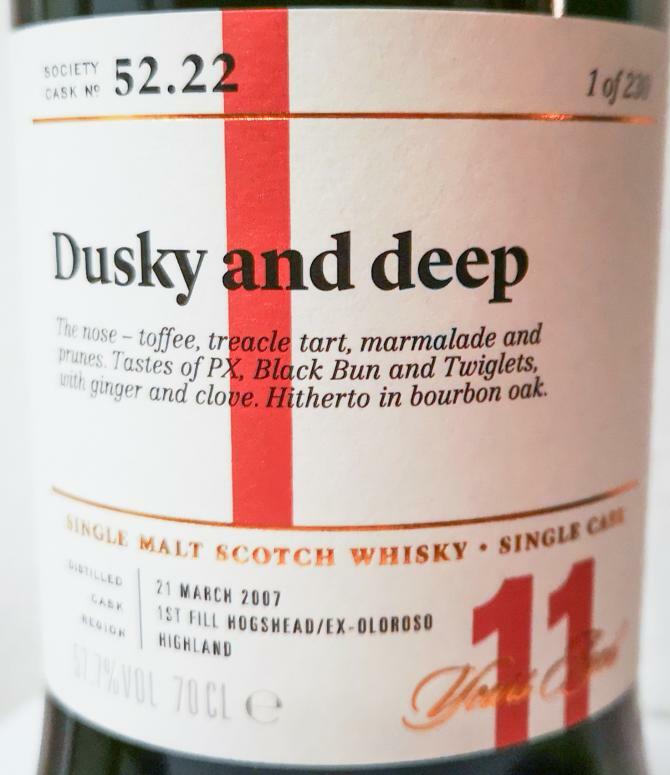 "The sherry influence is unmistakable – dusky shades of toffee, brown sugar, molasses, Macaroon bars, treacle tart, prunes and Serrano ham; also hints of tree bark, tobacco leaf and attractive leather. The palate is full-on – treacle, cough medicine, dried figs and dates, Black Bun, dark chilli chocolate, PX, Fernet Branca, quince jelly, pardon peppers and a spiced oak finish. Water brings thick-cut marmalade and salted caramel to the nose; the taste now combines rich fruit cake and Twiglets; with dry ginger, liquorice and clove to finish. After 9 years in ex-bourbon oak we transferred this to a first-fill Oloroso hogshead."